Recently Jane’s snow pants went missing. I’m not sure how regular of a reader you are, or if you live in the area, but this is January in Wisconsin. It’s cold and we do things outside. Snow pants are super necessary. On the evening it was discovered that Jane’s snow pants were missing, we were on our way to the kids’ cross country ski lessons. Again, when you are seven and the windchill is in the single digits snow pants are super necessary for skiing. In attempting to track down the snow pants we decided that they were either, still at the ski place from last time we were there, left at Grandma’s where the kids had been since the last time they skied or in the back of the truck in the ginormous pile of bags, ski clothes and general debris. The only thing we knew for certain was that they weren’t in the truck and so a lively discussion of where they might be started. It was all hypothetical and going fine until Jane panicked when she realized she might have left them at Grandma’s, about a two hour drive from home. Then I reminded her that Grandma is a wonderful Grandma who will pack up forgotten items and send them in the mail the next day. “The rainbow crown that Otis broke and then that one guy was at our house I think his name was uhhh Matt, yeah Matt and he fixed it with that thing that started on fire in his pocket and then I left it at Grandma’s and then she mailed it to me” Jane explained. I broke in with a “Wow. Yup. She’s right, good memory Jane” (Because Otis is a little boy who moved across the country almost three years ago and the man who fixed it was indeed named Matt and she only met him that one night, and no matter how you cut it that’s a pretty good memory). They were at the ski place. She… forgot… them there. Christmas was shaping up to be a peaceful and joyous celebration, pretty much. Kids were well behaved, mostly. The collective pack of dogs was well behaved, mostly. It was basically just right. It was surprising for some of us. It was death defying for others of us. There were tears, of laughter. And Christmas was never the same again, but in a good way. May all your celebrations be dinosaur infested and full of laughter! … and we don’t always say it like it’s a good thing. 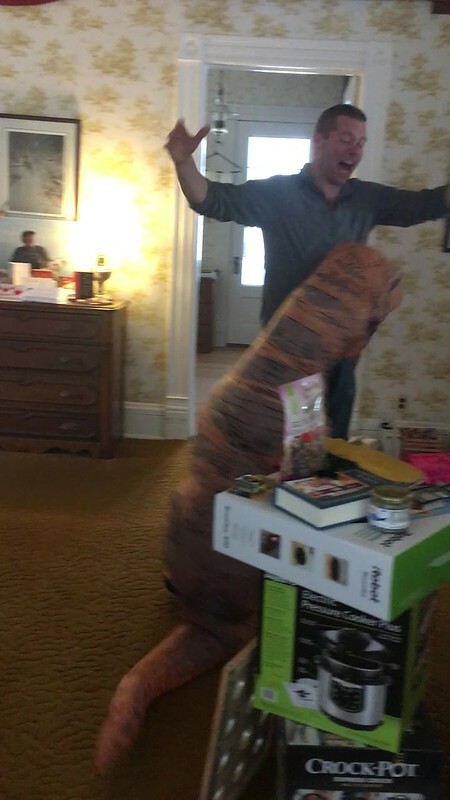 … it’s a drama queen opening her gifts. Happy seventh birthday to our favorite drama queen! White elephant gift exchanges and children don’t mix well. Or rather they mix far too well. You know what they say… one man’s trash is another little girl’s portal to hell. I’m using the other bathroom from now on.